Most movies about motherhood take a woman from bump to baby in the blink of an eye, amidst a wardrobe of designer duds and perfectly applied makeup in the delivery room. But pregnancy is so much more than a made-for-movie-length journey. With 40 Weeks, husband-and-wife filmmakers Christopher Henze and Dominique Debroux have created a documentary that covers the full experience, from the positive test to the positively overwhelming joy of welcoming a child into the world—and everything in between. And that’s what Healthy Mom&Baby heard when we sat down with a few of the moms featured in the film to talk about their experiences. While being filmed for 40 Weeks, Natalia decided to explore birthing with a doula. First up: find out what a doula is! “Once it was explained to me, I was like, ‘Can I have 2? !’” she says. “My doula, Corrinne, was amazing. She never pushed me—she made everything my decision.” Midway through her pregnancy, Natalia opted to have a natural water birth. “I realized that I wanted to try to give my daughter the very best entrance into the world,” she says. “The morning sickness was consistent… and it wasn’t just in the morning,” says Vicky Vargas. “There were days when I was throwing up under my work desk in the afternoon.” After having experienced a miscarriage in June 2013, Vicky and husband José experienced many mixed emotions when she realized she was pregnant again. “I was excited, scared, overwhelmed; it was a rollercoaster.” But nothing compared to that 1st ultrasound. “We were so happy when we saw that heartbeat,” she remembers. After 41 weeks of pregnancy, baby Josiah was born on June 10, 2014. “I honestly feel like Superwoman because of what my body was able to do!” Vicky says. “Before I became a mother, I had no idea what to expect emotionally,” says Phoebe Hamilton. “No one can know until they become a parent.” She gave birth to son Silas in 2010; 4 years later, she and wife Jen were ready to do it all again. 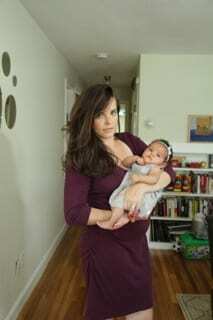 However, Phoebe had struggled with a frustrating and exhausting condition in her first (and subsequently, her second) pregnancy: hyperemesis gravidarum, or severe nausea and vomiting. “My family may not agree, but the hardest part about being pregnant wasn’t just the physical stuff, but the emotional toll it took on me,” Phoebe remembers. She credits her midwife for helping her through the tough times, reminding her that this wasn’t a permanent condition. Considering her difficult pregnancy, Phoebe says that “labor and birth were amazing” —and she did it all naturally. “I kept changing positions and walking and showering, and it was tolerable.” Not long after she’d begun laboring, she got a little overwhelmed and became adamant that she “no longer wanted to give birth”—then the nurses knew it was time. Willow was born shortly after, on July 9, 2014. “About an hour or 2 later, I felt like a million bucks,” says Phoebe. My Baby Cries Every Night: What Is Purple Crying?